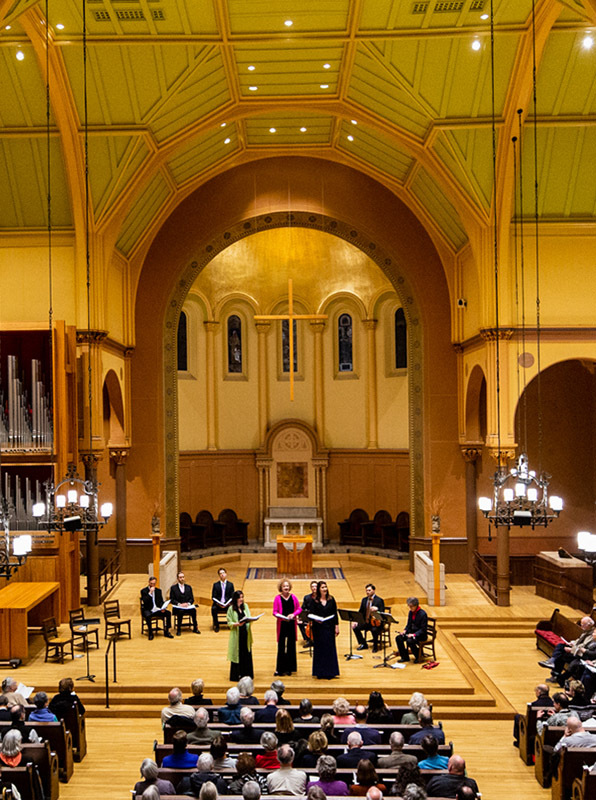 For decades, the Boston Camerata has been known for its performances of early music, covering a wide chronological span, though in recent years it has tended to focus on the Middle Ages. But periodically, starting with the former musical director Joel Cohen, and now continuing with his successor Anne Azéma, the ensemble essays music closer to home both geographically and chronologically—music composed and performed in in these parts from the 17th century into the early 19th. This development came quite naturally, since the early English settlers had lived in the Golden Age of English music. Even if there were no professional musicians among the earliest settlers and few if any musical instruments, they all traveled with their own voices, which were the basis of much of their music life. Such older American music resounded Friday night at the First Church in Cambridge. They brought with them remembered melodies, to which the members of a church congregation sang versified translations of the Psalms of David. Some of the most familiar melodies went back to the French Huguenot tradition in the middle of the 16th century. (The oldest song in the Camerata performance, and—ironically—the one best known to the audience, which was invited to sing along—was the tune used for Psalm 100 in the Geneva Psalter of 1555; it was carried the hearts and minds of the Pilgrims, and was used for various Psalm texts, but most especially for the 100th Psalm again. The tune therefore came to be known as Old Hundredth; it is still sung today in virtually every Protestant church. Though the Camerata included that particularly venerable melody, most of “City on the Hill,” consisted of later songs actually produced in New England over the course of the next two centuries, a total of nearly three-dozen songs intended for various purposes in the life of the community. For this performance, the ensemble consisted of six well-matched voices, led by mezzo Anne Azéma with soprano Camila Parias, alto Deborah Rentz-Moore, tenor Daniel Hershey, tenor Michael Barrett, bass-baritone Luke Scott, and three instrumentalists—Jesse Lepkoff (flute and guitar), Eric Martin (violin), and Reinmar Seidler (cello). Listening to a string of short pieces can become a bit overwhelming in a full-length concert, but Camerata arranged the program to provide maximum variety: by the number of verses, which made some songs longer than others, by vocal choices ranging from unaccompanied solo to trios of the female or male voices, by solo voice with a varied accompaniment of other voices, or by the addition of one or more instruments, and, finally, by the full ensemble together. The division into three thematic groups came according to the purpose that the music played in the culture of the time. Most set sacred texts, but some were simple harmonizations of tunes brought from Europe, others were in the rough-and-ready style of self-taught American singing masters, like William Billings, and others were single-line melodies from the large Shaker repertory. A Prologue illustrated the main types, introduced by the pure tones of Anne Azéma on a Shaker tune, “In Yonder Valley.” “Sin and Judgement” comprised generally darker songs, with special solo contributions by Barrett (Psalm 130) and Rentz-Moore “Judgement Hymn.” “Tavern and Tabernacle” included items both sacred and secular, the latter rather lively. Hershey and Parias duetted on “The New Union,” by Jeremiah Ingalls. All of the singers took part in the lively tune “The Devil’s Nine Questions.” Rentz-Moore was accompanied by violin in “The Miller of Dee.” The instrumentalists played an Englise ballad on the subject of Captain Kidd. The spirit, warmth, and energy of the singers and instrumentalist of the Boston Camerata provided a splendid evocation of the American past, but with just one or three singers, often unaccompanied, the barrel-vault ceiling of the church and the vast open space provided an acoustic that swallowed up consonants and made it nearly impossible to understand the words. But the voices beautifully blended throughout. Steven Ledbetter is a freelance writer and lecturer on music. He got his BA from Pomona College and PhD from NYU in Musicology. He taught at Dartmouth College in the 1970s, then became program annotator at the Boston Symphony Orchestra from 1979 to 1997.